Super Mario Land was one of the original Game Boy’s launch games, so it’s only fitting that it was the first Virtual Console title on the 3DS. So how does it hold up more than twenty years later? So if you’re familiar with Mario’s NES outings, you’ll probably be familiar with Super Mario Land to a degree. Run to the right from the start of the level to the…door at the end? Stomp on a Koopa Troopa and…it explodes beneath your feet? Plunge into the ocean and wipe out enemies…in a submarine? Okay, so the formula was tweaked a little for the first portable Mario game, but it’s still Mario. He’s just in a different kingdom (Sarasaland) trying to rescue a different princess (Daisy) from a different villain (Tatanga). Got it? Good. Sarasaland consists of four worlds with three stages each. In each third stage, Mario is forced to fight a boss. You can either step on the axe behind it to defeat it (ala Super Mario Bros.), or you can shoot them to death with Super Balls…Super Balls, you say? Well, the Fire Flower in the Super Mario Land doesn’t give you fireballs, it gives you Super Balls. You can only shoot one at a time, but they bounce off walls and can collect coins for you. Cutting edge graphics, circa 1989. The exceptions to the “traditional” Mario games are levels 2-3 and 4-3. In 2-3, he’s in the Marine Pop (a submarine) and in 4-3, he’s in the Sky Pop (an airplane). 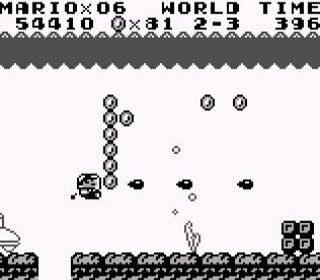 The screens scroll automatically, and Mario can move all over the screen to get coins, shoot baddies or collect power-ups. Basically, a platformer becomes a SHMUP. Not a bad thing, but it throws you for a loop the first time you see it. If you can clear the game once, you open up hard mode: same levels, but different enemy placement that makes it more difficult. If clear hard mode, you gain the ability to choose whatever stage you want. Even though there are no warp zones, beating the game twice through should only take an hour or so. The controls are what you would expect. Move Mario with the d-pad, hold B to run and press A to jump. Press B to shoot a Super Ball (if you have the power to do so). When Mario is in Sky Pop and Marine Pop, shoot by pressing A or B. Mario controls a bit floatier than he traditionally does, but you’ll get used to it. Graphically, don’t expect a masterpiece since the 3DS only allows the original color palette. Still, the visuals do what they need to in only a few colors. Everything moves fluidly, though some enemies are a little too tough to see. The increased resolution of the 3DS sort of fixes that problem. The music is decent for 1989. It’s not the Game Boy’s best, but for a launch title, it’s fantastic. You’ll find yourself humming some of Mario’s melodies in no time. The bottom line is that for $3.99, you get a game that’s not too long, but is a lot of fun to play. Download it and enjoy this odd piece of Mario history. I've never played this odd little game, since I was kind of holding out for SML remakes. But I can't wait any longer! $4 means that it's go time. I just checked and I can't believe I gave this a 7. Must have been the nostalgia. I lowered it to 6. A good review for a very good game. Haters be damned, Super Mario Land is a classic in my eyes. Posts like that should lead to a de-modding! I have no nostalgia, I played it for the first time a couple years ago, and I would give it probably around an 8. It's pretty fun, if a little wonky, but the music alone makes it worth playing. Good review. I'd probably rate it a little lower, but I'm still mostly positive about it. Since R&D1 was more or less inventing portable gaming as we know it with the Gameboy, it seems a bit unsporting to go too hard on one of their launch titles, even if it is a Mario game and should be held to Mario standards. It might be the only Mario platformer of which I'd say, "Only for fans". But considering everyone's a fan of Mario, maybe it's pointless to even say that. Mario in a submarine. That's reason enough to play it, right? I was kidding about the nostalgia thing. I convinced myself I liked the game as a kid after a while, but initially even a 10 year old could see it was rubbish, especially considering at the time I got it, SMB3 was out. I mean, put yourself in that kid's shoes: his friends are playing SMB3. And you're playing this... this thing. Super Mario Land 2 was better? All the Game Boy "Mario" games were so weird, at least we got Wario out of the deal. I pretty much agree with you @ludist! I'm glad you pointed out some of the oddities about this game and how it stands out from the other Mario platformers (good writing style BTW): the shooter levels, the exploding koopas, the Super Ball, etc. Strange indeed. But man oh man, I was crazy, absolutely crazy about this game when it came out. @GameDadGrant Yes sir, you are most correct. You can't really compare it that way. So what if Super Mario 3 was already out? It still wasn't Super Mario Land. Not to mention with Super Mario 3, you're tethered to a TV at home. You can play Super Mario Land on the bus ride to school. Don't listen to Guillaume. He's French. What does he know? Personally I give it a 7.5 still a good game especially for the time but Super Mario Land 2 was such a step above it it is almost ludicrous. Nice review @ludist210. I personally would have given it a 7. I actually have to agree with @Guillaume here. Even as a kid, I knew the game was wonky. I expected to have a portable Super Mario Bros. and what we got was...different. It still is a fun game, however, and it makes me eager to play the second one. The second one is a little more "traditional", in a way, though it still has its quirks. I prefer the second to the first, though they're both fun. Success! Enjoy your first romp through Sarasaland! I had it rated even higher before this play-through. It has its quirks, but it's still a lot of fun to me. A little frustrating at times, but not bad at all. I bought this off eBay couple years ago and played it once before putting it down eternally. I guess you had to be there. I wasn't there and I liked it! Despite it's differences from mainline Mario games, I still think it has better mechanics than most platformers and it is pretty challenging which I like. And again, the music. Yeah the underground music was pretty good. The Brawl version was good too. @GameDadGrant Yeah, but Super Mario Bros. 3 is so much better it's not even funny. However, it's not fair to compare the two. They're two completely different games. I love this game. It's just so weird. I'd love to see a direct sequel set in the same world (along with a direct sequel to Super Mario Bros. 2/USA), which will obviously never happen, but a man can dream, right? @Guillaume Super Mario Land came out before Super Mario Bros. 3 though. As a "sequel" purely to the original Super Mario Bros., Super Mario Land is great. When I was a kid one of my babysitters let me play her copy of Super Mario Land once, but aside from that time I didn't have much experience with the game until getting a copy for myself on Ebay about a month ago. Personally, I love Super Mario Land. I haven't rated it yet on Negative World, but I think I'll give it a 10. It's like a Bizarro Super Mario Bros., and it's awesome. If the Mario series had expanded further in this direction, I would be totally fine with that. The odd quirks of this game are great, and I love the level design and especially the music! I love that song so much Really the only negatives I can say about the game are that I wish it were longer, and that the size difference between Mario and the blocks wasn't out of sync with each other. Everything else about the game (even the physics, which I got used to) I love. I can't wait to play the sequel (which is also on its way!). So I finally finished this epic, having never played it before the 3DS. I liked it! The feel of Mario is certainly... different, and the 3DS' options for input are, as usual, tragic, but, once I got used to the new (old) style of movement, I enjoyed Super Mario Land quite a bit. It was kind of tough! But then, so was the original Super Mario Bros. I appreciated that challenge, along with the variety, the novelty, and the overall rejection of cliches. R&D 1's weird (post-Black Box) instincts usually bring a smile to my face, and SML was no exception. I'll definitely play through it again.